Brighton Zeuner, 11, is hoping to become the youngest athlete to medal at the X Games when she competes in the Skateboard Park competition on Saturday. Watch out. An 11-year-old girl laces up her worn, black Vans. She replaces her teal beanie with a helmet. She slips on elbow and knee pads. Her feet cling to her skateboard, a.k.a Richard, whom she takes everywhere. She stands at the edge of the course at Alga Norte Park in Carlsbad, California, in late May, and the boys clear out. Brighton Zeuner takes off, whirling around the bowl's curves, creating her own rhythm as her long, blonde hair catches the wind. Ignoring a headache from the tightening of her teal braces and shoulder pain from a recent fall, Zeuner enters a flow and rehearses trick after trick. "On my board, I feel free," she says with her eyes sparkling, her smile as big as the bowl she's skating in. "This is something I can't live without." Everyone here knows her name. 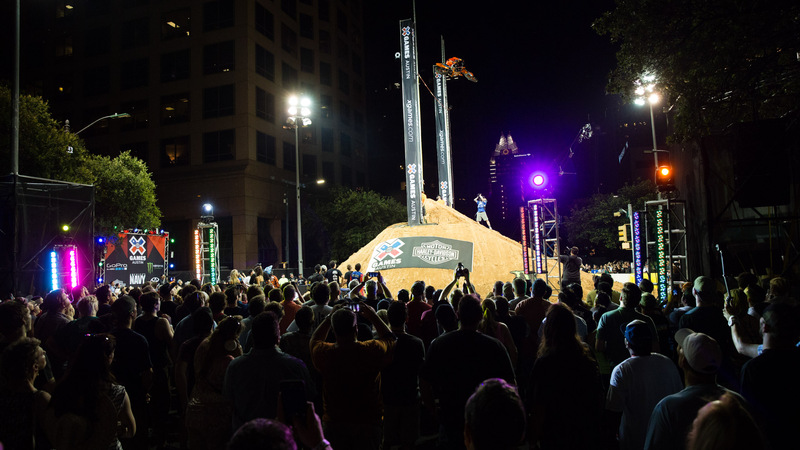 She's the youngest female athlete to be invited to the X Games. She'll be skating against women twice her age on Saturday in the Women's Skateboard Park competition. "She's a 4-foot-8 powerhouse," says skateboarding veteran Jeff Grosso, 48, who skates with Zeuner. "She makes it look easy." 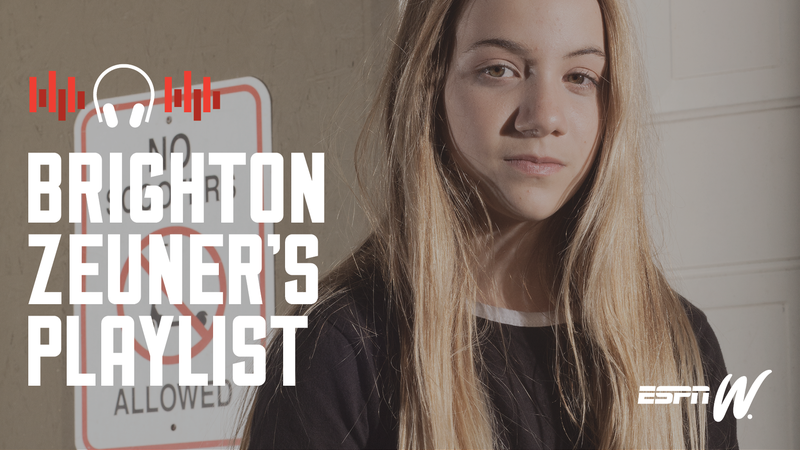 Brighton Zeuner started skateboarding when she was 5, and her brother says she quickly got "really, really good." A few hours earlier, Zeuner stops at Sambazon Acai Café. She orders an acai bowl topped with granola, bananas, strawberries and blueberries. "Can I get it with coconut and honey?" she asks. Zeuner is like any other 11-year-old girl. She loves Beyonce and Nicki Minaj ("I like when she's rapping about girl power.") She writes in a journal with a different color each day. She enjoys beaches, bonfires and painting her nails. She wants to drive a white Jeep one day. But she's not like most girls. This sixth-grader competes in women's pro divisions and attends private tutoring instead of regular school. She fell in love with skateboarding at age 5, when her family was living in Phoenix (they moved to Encinitas three years ago). Barefoot, she would push on the tail of a board that didn't have wheels and turn it around on the carpet for hours. She would go to the skate park with her older brother, Jack, and soon she started asking for a board, which Santa Claus brought for Christmas. Zeuner had natural form, dropping in on mini ramps. But a hard fall led her to take a break from the sport. After trying softball, ballet and Girl Scouts, she caught the skateboard bug again at 8 and often stayed at the park past sundown. "She got really, really, good," Jack, 13, says. "She pushed herself." Zeuner dominated the female amateur circuit, became the World Cup skateboarding overall points winner in 2015 and collected four first-place finishes that year. 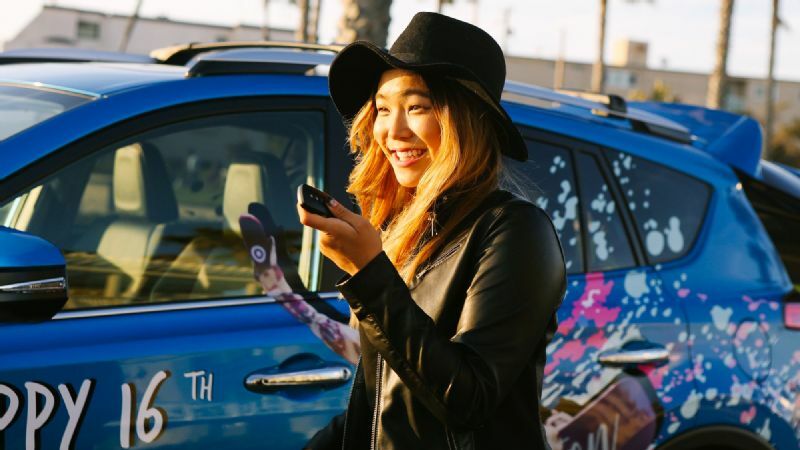 She also became the youngest girl to compete with amateur status in the Vans U.S. Open Pro/Am (she finished seventh). She loves beating the boys. Once, she was in a contest against 150 of them. "We would always tell her: You can do everything boys can do," her father, Brandon Zeuner, says. Zeuner began competing in pro women's divisions this year, and she took fourth and second at two contests. She became the first female cast member of the series "Camp Woodward." Now she is inspiring the next crop of female skaters, just as she was inspired by those before her: Mimi Knoop, Cara-Beth Burnside, Nora Vasconcellos, Lizzie Armanto and Alana Smith. "She respects and admires them and wants to be like them," her mother, Bridget Zeuner, says. "But she's showing, 'I can do this too, so I'm going to work as hard as they do.' It's pushing them. Nora Vasconcellos joked about it: 'Shoot, little one's coming up. I need to dial up some new stuff.'" 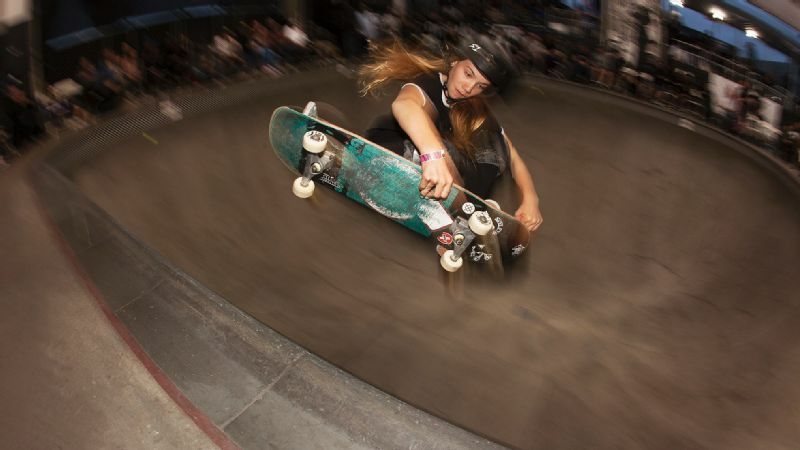 Knoop saw Zeuner hold her own against pros at the Vans Combi Pool Classic in January, held at the Vans Skate Park in Orange, one of the most challenging bowls in the world. "She went to town in that thing like a surgeon," Knoop, 37, said. "She's a tiger. She's not scared to try new things." Zeuner composes a trick list that she must conquer each week. Last year, she labored to master a stalefish, which involves grabbing behind your back foot with your back hand and going frontside in the air. Slam after slam, Zeuner's body ached. She was on the brink of tears. "I wouldn't stop until I got it," she says. Minutes after landing the trick, she was on to the next one. At 11, Brighton Zeuner is already inspiring a new generation of skateboarders. "This is my playground," Zeuner says while pointing to a 10.5-by-40-foot vert ramp in her backyard, which also features a swimming pool. The ramp, built in 2013, has drawn some of the top pros, such as Grosso, Darren Navarette, Lance Mountain, Christian Hosoi, Chris Russell and Ben Raybourn. She studies their tricks and creates her own. They offer pointers and challenge her. They don't mind that she's 11 because they all speak the same language. They cling to the belief that they aren't people who skate; they are skateboarders. Zeuner's backyard is paradise: endless skating with friends, endless sun, endless opportunities to prove herself. "I love the feeling when everybody's stoked and everybody's cheering," she says. "There's just no bad vibes." Zeuner isn't intimidated, no matter whom she's up against. "I've seen her literally be on the ramp with big, gnarly, older, tough guys, and she can just jump right in there and hold her own," says veteran Neal Hendrix, 43, who cast Zeuner in "Camp Woodward." Zeuner isn't the only one benefiting from the sessions. "We all love to skate with her," Navarette, 41, says. "She actually helps push us because she's pushing herself. She's got a lot of respect from everybody." All of a sudden, a snake session, in which multiple skaters take the ramp, breaks out during a pro vert contest in April in Sweden. Four veteran women join Zeuner in the free-for-all, in which there are no rules and one mistake could land a skater in the hospital. The crowd roars. Music blasts. Zeuner barely dodges a few collisions. Fearing the worst, her father puts his camera down and prepares to run to the ramp. Zeuner was determined to land a lipslide revert, a trick that gives even the most seasoned vets trouble. She fell 20 times in four minutes. The wind was knocked out of her, but she kept attempting the trick. "She's a little maniac," says pro skateboarder Rune Glifberg, who was in attendance. "She was weaving in and out of the big girls, nearly getting run over. She didn't care." When Zeuner finally pulled it off, she raised both of her arms and flexed her muscles. She was glowing. She was free.